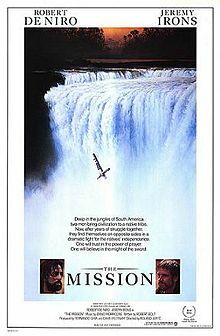 One of the most memorable scenes in the film takes place when members of the Guaraní community living above Iguazu Falls tie a priest to a cross and send him over the falls to his death. The Mission is 25 years old this year. The story of a Jesuit missionary in 18th century South America was written by Robert Bolt and directed by Roland Joffé. The cast included Robert De Niro, Jeremy Irons, Ray McAnally, Aidan Quinn, Cherie Lunghi and Liam Neeson. The music by Italian composer Ennio Morricone is regarded as one of best film scores of all time. Iguazu Falls, one of the 28 Official Finalists in the New7Wonders of Nature, and shared by Argentina and Brazil, had a key role in this powerful film.